The marinade for this chicken recipe provides a savory flavor that doesn't overpower the grilled flavor of the chicken. 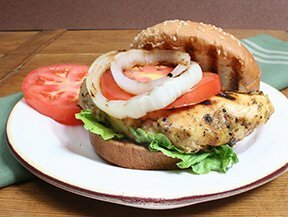 This moist and tender grilled chicken is great when served alone or as a sandwich as suggested in this recipe. It will make a perfect addition to your Memorial Day menu. Get suggestions on how to makeover your burgers to create the perfect burger for you and your guests this Memorial Day. See how easy it is to produce moist flavorful chicken in our video on how to grill Beer Can Chicken.